Located in the south of Ibiza, Sant Jordi de Ses Salines property is located in one of the most convenient and quiet villages with fantastic views of the sea, the salt pools of Las Salinas, and the neighbouring island of Formentera. Second home buyers are attracted by this area not only because of its beautiful natural environment but also the proximity to the airport and the best entertainment hotspots and beaches on the island. 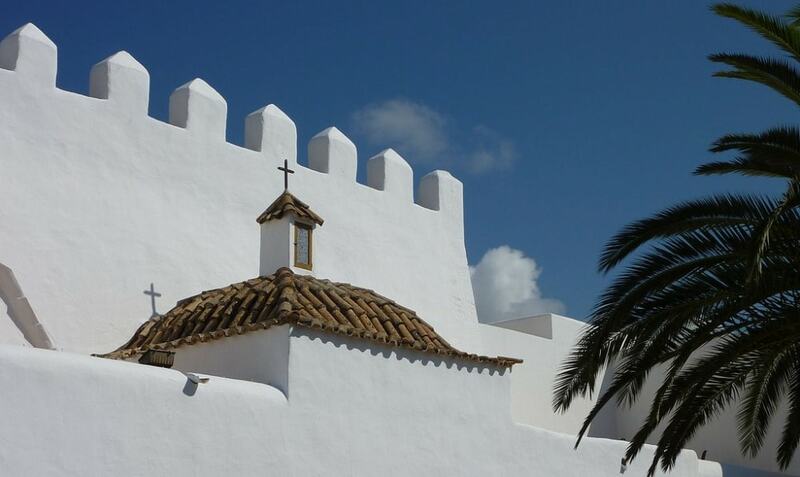 Sant Jordi de Ses Salines property market is mainly presented by traditional Ibicenco-style houses and villas. An average price for a house in the area is around Average price per sqm. in Sant Jordi de ses Salines €6,637 0% properties#: 53 last change on: 23 Apr 2019 €6,637 per sq. meter, with highly appreciated sea views pushing the price up. Apartment currently have an average rate of Average price per sqm. in Sant Jordi de ses Salines €4,617 0% properties#: 10 last change on: 23 Apr 2019 €4,617 per square meter and investment opportunities available are at Average price per sqm. in Sant Jordi de ses Salines €3,219 0% properties#: 2 last change on: 23 Apr 2019 €3,219 on average. The most active agencies on Sant Jordi de Ses Salines property market are Luxury Villas Ibiza, Ibiza Agents and ImmoAbroad. Why Sant Jordi de Ses Salines property? The privacy and natural surroundings of the hills of San Jorge ensure a pleasant stay on the island. Enclosed by pine trees and the typical natural Mediterranean surrounding, it is a perfect place to chill out. Conveniently, the nearest beach is just 5 minutes drive away from the residential area. Sant Jordi de Ses Salines (or San Jorge) is the nearest village to the airport (just 5 minutes driving away). 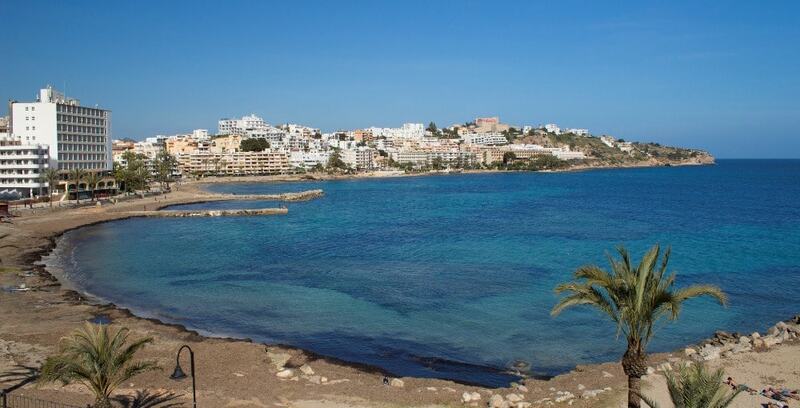 The boisterous and cosmopolitan centre of the Ibiza Town is also in the closest proximity. The highlight of the village’s centre is its magnificent fortified church, beautifully surrounded by flowers and palm trees. Just after crossing Sant Jordi on the way to the airport, there is a horse racing venue, where a popular Saturday market is held. Here you can buy second-hand items, handicrafts, and clothing. The village has several restaurants and shops, too. Since the area is very closely located to the Ses Salines Natural Park, there are many unspoilt beaches around. Among them, Ses Salines and Es Cavallet are the two most popular and emblematic beaches of the island, highly secured for its big ecological value. 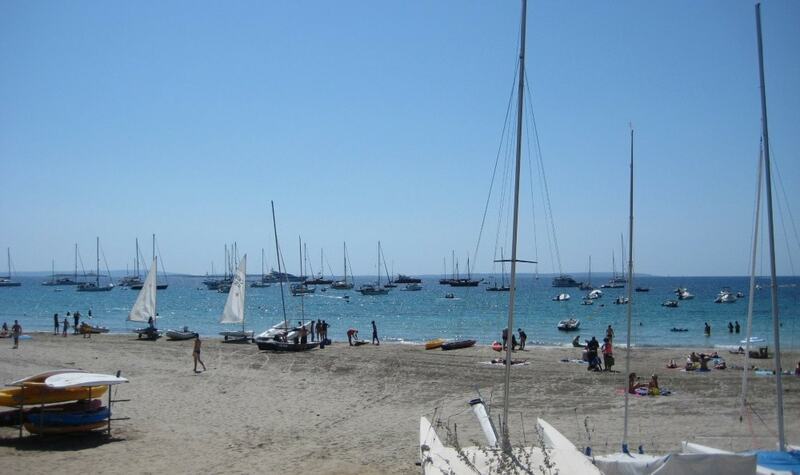 Es Cavallet beach is amongst the most well-known pioneering nudist beaches in Spain. This extended beach is surrounded by abundant plants and dunes that give it a look with a wild touch. Along its shore, you will find superb places to sunbathe and swim in its crystal clear blue waters. A fairly exceptional beach of Ses Salines is very popular and especially attractive to the affluent and upscale crowd. 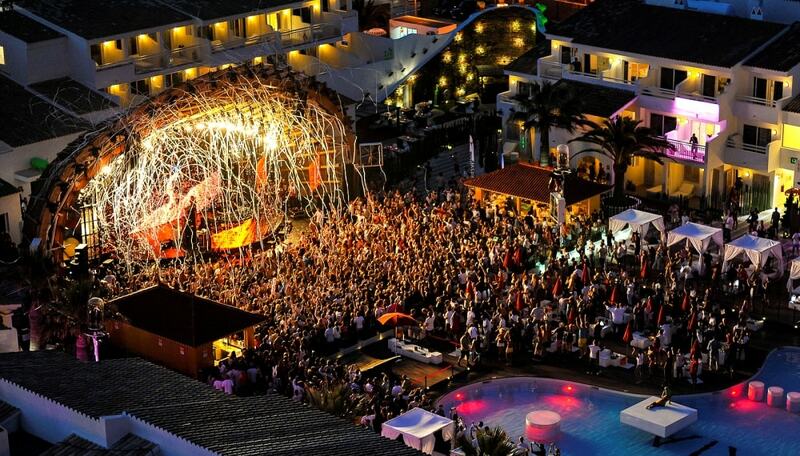 However, here you can see celebrities, party goers, families, hippies, and everyone else. Its crystal clear turquoise waters and fashionable restaurants give it a very nice atmosphere. Named after the salt planes, which over the years supplied the main export industry to the island, Salinas has something for everyone. Whether you want to relax and enjoy the sun, or sip cocktails on your sun bed listening to the coolest soundtrack from the seasonal artists, swim in the clear sea or learn diving at the famous dive school, Ses Salinas has it all available for you. Even though cliffs, dunes, and salt fields that run along the rocky coastline give it a feeling of exclusivity and isolation, the beach nevertheless pulses with life, and may be crowded by early afternoon in the summertime. 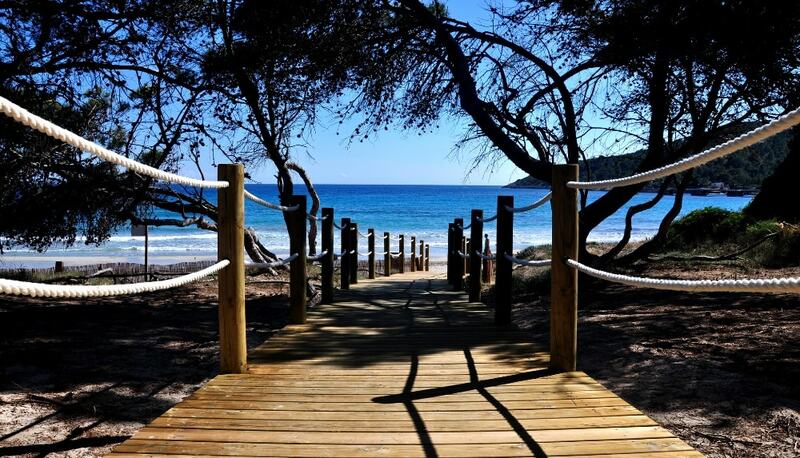 The beach is adjacent to the Natural Park of Ses Salines, a protected area due to its strong ecological importance. The necessity to protect over 200 species of birds and other flora and fauna made UNESCO declaring it a world heritage site. For bird enthusiasts, it is especially interesting to visit the Park in the months of July to October and also February to May when flamingos and herons are at their peak. The salt fields have been in use for more than 2,000 years and developed ”white gold” of Ibiza. It had been the island’s main export industry until tourism was established here. Because the water disappears over the hot summertime, a crust of salt is left on the bottom of the lakes making an amazing view every night as it sparkles when the sun sets. The residential area is also very nearly located to the action of the trendy resort of Playa d’en Bossa (only 10-15 minutes on foot). Its longest stretch of sand on the island has gone through a remarkable change in recent years leading to a transformation similar to Miami’s ultra cool South Beach. The golden sand and clear blue water are ideal for unwinding and getting a sun tan, but there is also much more to accomplish. With such popular beach clubs as Ushuaia, Space, Bora Bora, to mention a few, it has also become the leading spot for the jet-setters. Ses Salines residential area is an ideal spot to relax and unwind and enjoy the exclusive atmosphere of the southernmost beaches on the island.